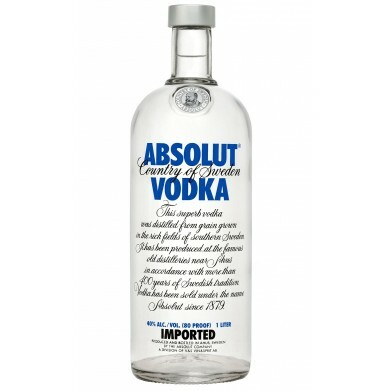 ABSOLUT VODKA LTR for only $24.99 in online liquor store. Info! We ship hard liquor & wine only in MN. We ship wine only (no hard liquor) to the following states: Alaska, California, Idaho, Louisiana, Missouri, Nebraska, Nevada, New Hampshire, New Mexico, North Dakota, Oregon, Virginia, Washington DC, West Virginia, Wyoming. Wine shipping to other states is prohibited by law. Clean and crisp with faint lemon pie aromas; a faint taste of baked bread adds an extra dimension; character to be of martini quality; six parts to one part of dry vermouth. ©2016 Liquor Liquidator Inc. All Rights Reserved. Liquor Liquidators only sells wine to adults over the age of 21. You must provide a signature at the time of delivery. To ensure delivery we suggest shipping to a business address. Wine is not delivered to PO Boxes. By proceeding, you are confirming that you are 21 or older.